Protection of citizens from any form of external aggression is the sole mandate of the central government whose responsible of protecting its borders. However, this is not the case in Kanamkuny village in Turkana North. Here, villagers are forced to battle out with members of the Merille community from Ethiopia who frequently raid their village. Conflict between the villagers and the Merille also known as Daasanach from Southern Ethiopia dates back to the 1950’s. Cattle raiding, grazing grounds, competition for natural resources and ethnic differences are some of the reasons for the conflict. This has worsen up with the availability of guns to the two leaving dozens of people dead, scores injured and many residents homeless. Many of those killed during the raids are men leaving their responsibilities to their widows and children. To explore more about Kanamkuny and its residents’, predicament I decided to visit the village. In the company of my colleague Mike Mulure and Ramathan Ekitela, resident Lodwar, we leave for Kanamkuny, 200 kilometres from Lodwar town, a journey that will take us four hours. Here I am welcomed with the harsh reality of insecurity evident with the high number of men walking around with guns. Ekitela informs me that in this side of the world, a gun is a must-companion for all men and in some instances, women too are forced by circumstances to go their day to day activities with automatic rifles on their shoulders for retaliation in case of an attack. I realized that out of every five men we met along the way, at least three of them were carrying a gun. The G3 and AK 47 being the most common rifles around. The more we approached Todonyang, the less people we met. Here the atmosphere was tense and I could read fear in Ekitela’s voice each time he saw people coming towards us. ‘We are in a very dangerous area. The Merille killed four people in this area and we are not sure if they are gone,’ said Ekitela. He added that the Merrile are experts in camouflaging themselves in the environment. Finally, we reached Kanamkuny village and I realized the situation was worse than I thought. Here small boys some looking as young as 12 years are walking around with firearms loaded with bullets and ready to attack. 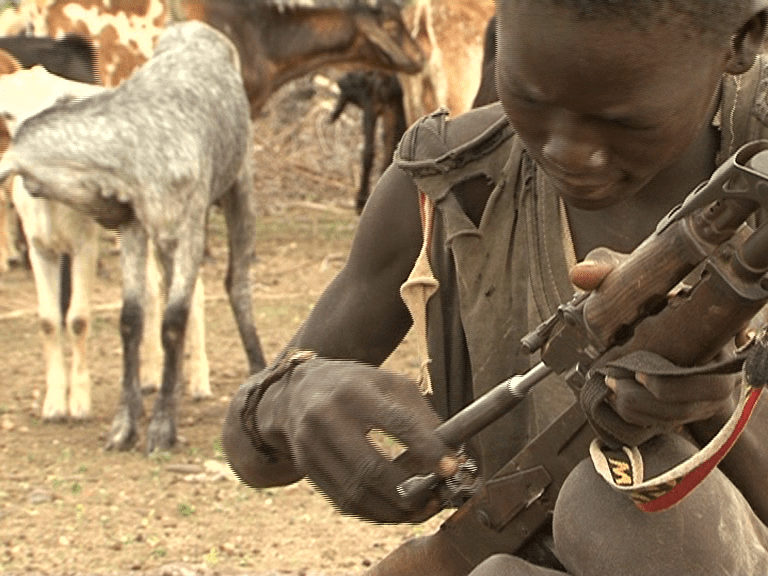 I speak to one such boy, 12 year old Lorunye Emekwe who owns a gun. His childhood innocence taken away by the callousness of insecurity. 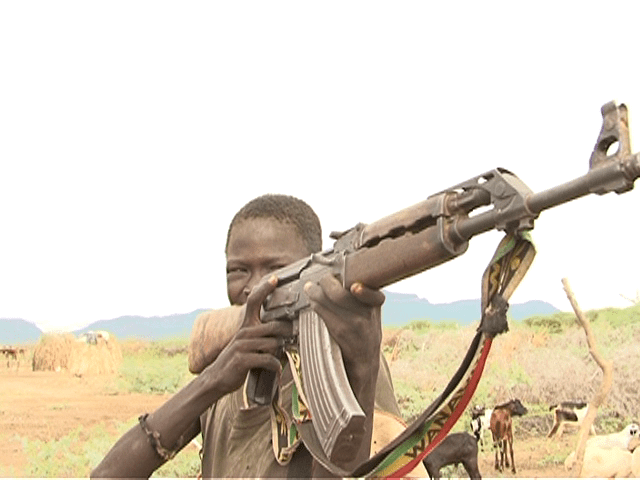 He says that he inherited this gun from his father who was killed by Ethiopian militia during a raid in their village. After his father died, lorunye took up the responsibility of providing and protecting his family as well as herding the family’s goats, which he says cannot be done without the gun. 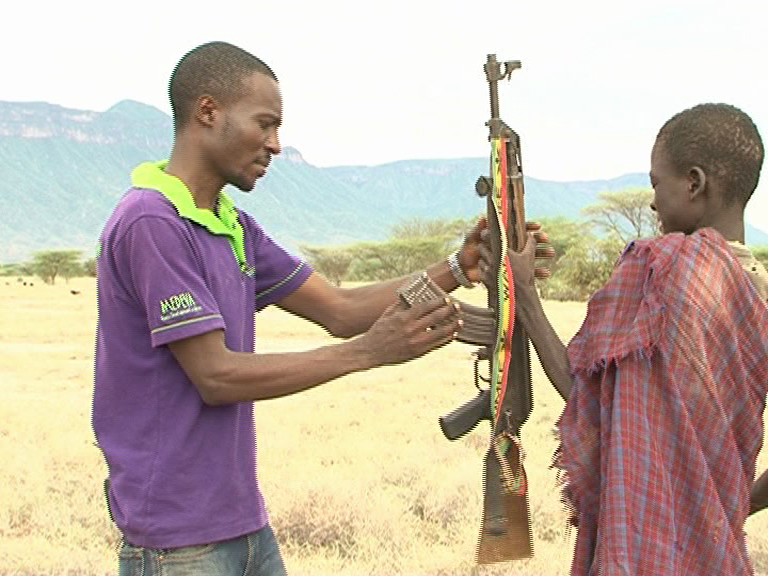 ‘I was given this gun by my mother to protect me from the Merille when I am in the field herding,’ he says. Lorunye is the first born son in a family of two. He currently stays with his mother and little brother. He says that he was taught on how to use and handle the gun by his late father. And he passes this on by taking time to teach his peers on how to use the weapon. 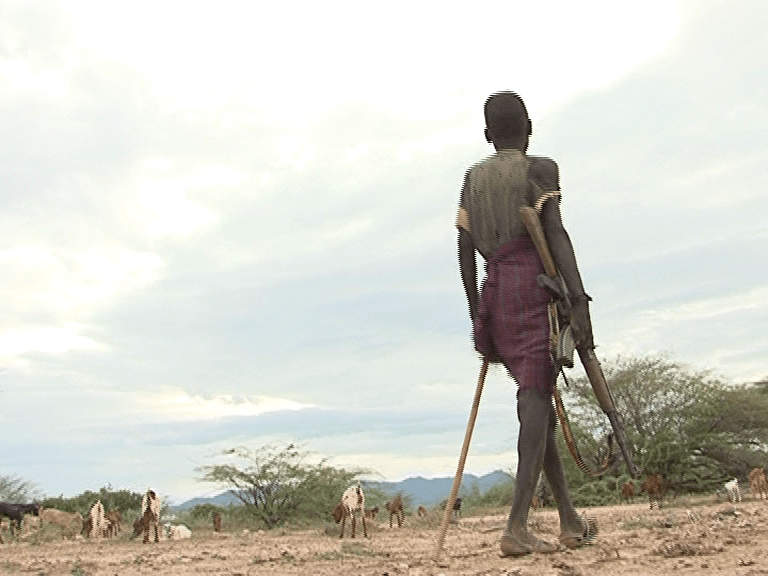 ‘I usually teach my friends on how to use the gun when we are in the field herding,’ He says. He adds that it is important for all the boys to know how to use the gun because when the enemy strikes they kill everyone irrespective of their age. 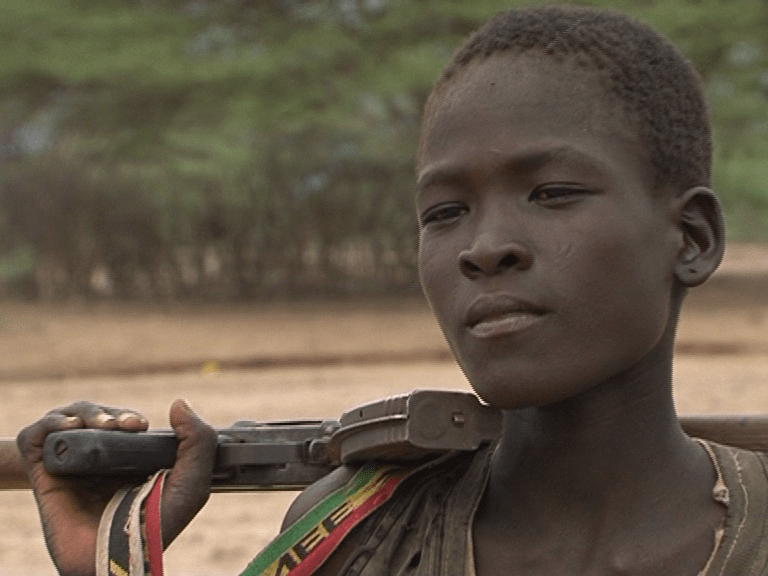 Although his face and voice depicts a shy boy, his courage and prowess is evident when he holds the gun. He proved his mastery in handling the machine when he dismantled his AK 47 gun, cleaned it inside, assembled it back and loaded the magazine with bullets before fixing it back on the gun. All this he did with ease just like a trained security personnel. Despite his tender age, Lorunye says he was once caught in the middle of a battle when they were raided in Todonyang, adding that this was the first time he used a gun. ‘I have used the gun once when the Merille tried to raid our cattle near Todonyang. We fought for about two hours but nobody was injured and the merille’s did not manage to take away our property so they left and we came back,’ said Lorunye. He further explain how people from his village get the bullets from a neighboring village called Meyian in exchange with goats. ‘If you have one mature he-goat you get 20 bullets if you have two you get 40 bullets,’ quips Lorunye. He says the use of the bullets depends on when they are raided and for how long a fight stays. He however laments the security situation in the area which he says has denied him a chance to be in school. Lorunye is a former beneficiary of Child Fund, an international charitable trust that aid deprived, marginalized and vulnerable children living in poverty. He was schooling in a nearby school called Lowareng primary school and he was in class three when he stopped going to school to look after his family’s goats. He believes that the situation will one day change for the better. ‘My future dream is to go back to school, finish my education, get a job and come back to help my people.’ He adds. I also spoke to Arukudi Ng’echwaye, lorunye’s mother who is still at pain of losing her husband to Ethiopian militia attack. 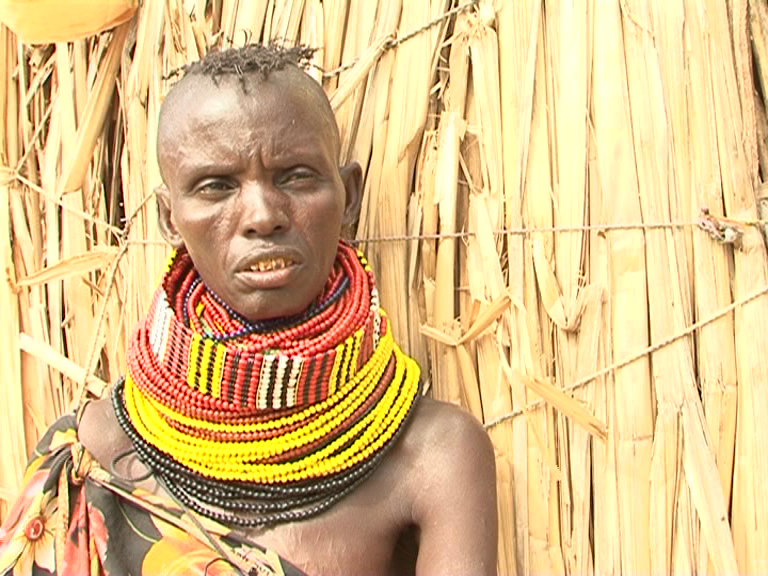 She says that their village has been forgotten by subsequent Kenyan governments. ‘Here we live by the grace of God because He is our protector. The government of Kenya doesn’t recognize us as Kenyans,’ she adds. She says that it pains her to see her son leave every morning to go herding carrying a gun not sure whether he will come back in the evening or not. She desires to see her son go to school but circumstances dictates otherwise. ‘I just wish that one day the government will come to prevent the Merille’s from coming to our land and a school built near that my son can go back to shape his future,’ she says. I speak to Christopher Nakuleu, area Member of Parliament asking him about the issue of insecurity in the area. According to him the constituency looses an average of 20 people due to attacks by militia from neighboring countries. He says that due to the inadequacy of the government to provide security in the area, locals have been forced to find their own internal mechanisms in insuring security in their villages. 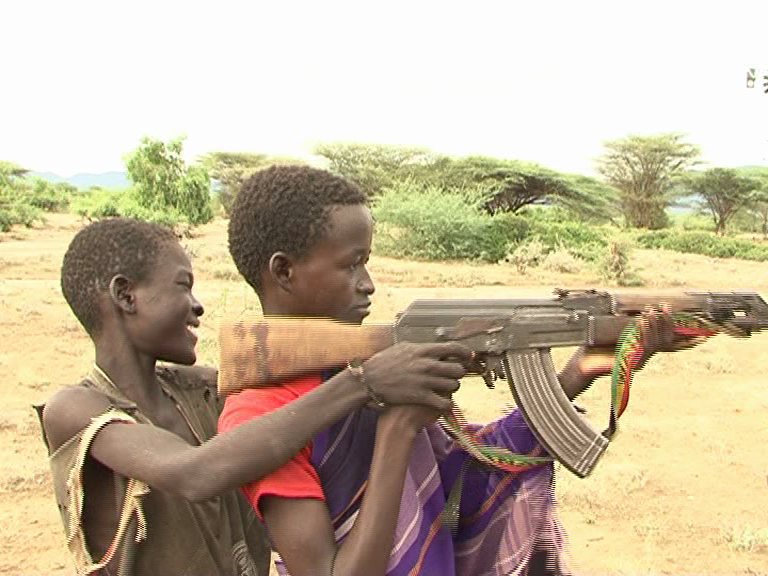 ‘That is why you find some young boys and even girls having these weapons, it is because of lack of government presence on the ground. In fact, if you go round the border zone the government is not present. The presence of government is not visible. The border is purely manned and protected by the locals,’ adds the MP. He says that the security issue is a reality that needs to addressed in the quickest way possible to end the senseless killings by militia from neighboring country. After spending two days in the village and witnessing the hardships the villagers go through thanks to insecurity, poverty, lack of basic amenities etc, I left a miserable man. Angered with the system! Why are residents of Kanamkuny village neglected? Why would we let these helpless civilians ‘protect’ our border? Are they less Kenyans than we are? My heart goes out to 12 year old Lorunye and all those children facing the same plight for i know as my little brother, cousin,relative, friend,neighbor wakes up takes breakfast then collects books and heads to school, his age mate in Todonyang (Lorunye Emekwe) wakes up checks his family’s goats collects gun that is loaded with bullets and heads to the field to herd all day long! My take: If we keep on turning on a blind eye on the issue we will be answerable to the future generations! As for me I have played my part and THANK YOU to all those(Individuals and Organizations) who have shown interest of helping out the boys.